Chances are you don’t think about rabies much—after all, most dogs and cats are required to be vaccinated and because of that, the disease is not as common or widespread as it once was. However, rabies is still as deadly as ever and still very much a danger for pets and people. 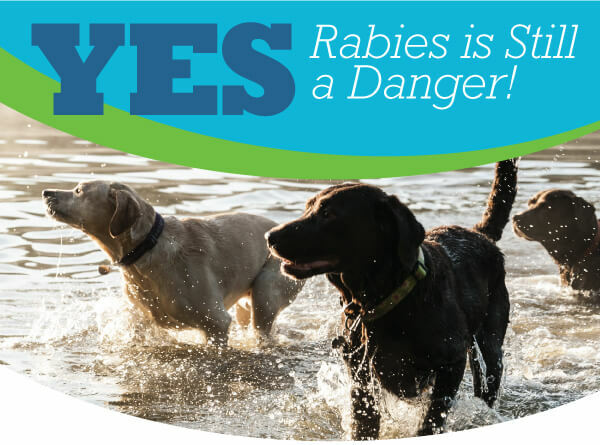 September 28th is World Rabies Day and we want to remind you that one of the most important things you can do to protect your pets is to keep their vaccinations current. Georgia state law mandates that dogs, cats and ferrets be vaccinated against rabies. This includes indoor cats which can also be exposed to rabies should they escape or if a rabid animal accidentally makes its way into your home. According to the Centers for Disease Control and Prevention, cats are over three times more likely than dogs to become infected with rabies. If you suspect your pet was bitten by or exposed to a rabid animal or need to get your pet vaccinated, schedule an appointment online or call us at (404) 991-2943.